The Kia Motors plant that recently started operations in Pesquería (near Monterrey), Nuevo León, waved the checkered flag to start the production of its Forte model, with the objective of producing one unit for every 56 seconds, or 64 vehicles per hour. The Korean automaker seeks to reach its goal of producing more than 300,000 cars a year and selling more than 11,000 Forte models just in Mexico during 2016. Forte belongs to the compact vehicle segment, whose exterior is equipped with daytime running lights LED (DRL), leveler height projection type headlights and front fog lights, aluminum 17″ rims, electric sunroof, rear spoiler and LED type rear lights. In addition, it has disc brakes on all four wheels, antilock brake system (ABS), electronic stability control (ESC), start assistant (HAC), system stability management (VSM) and six airbags: front, side and curtain close automatic speed-sensitive insurance opening in case of impact, rear view camera as well as front and rear parking sensors. Meanwhile, it is equipped with an audio system with touch screen 7″ Android Auto connectivity system. It also has paddle shifters behind the wheel (Paddle Shifter), system management mode normal, comfort and sport, Intelligent Key with Push Button Ignition and steering wheel and leather wrapped handle shift gear. In its most equipped version (SX), this model features the new Intelligent trunk with remote opening, power driver seat with two memories and power lumbar support; in LX and EX versions KIA Forte will be available with cloth seats in gray and black colors; while the SX version has leather seats in gray and black colors. 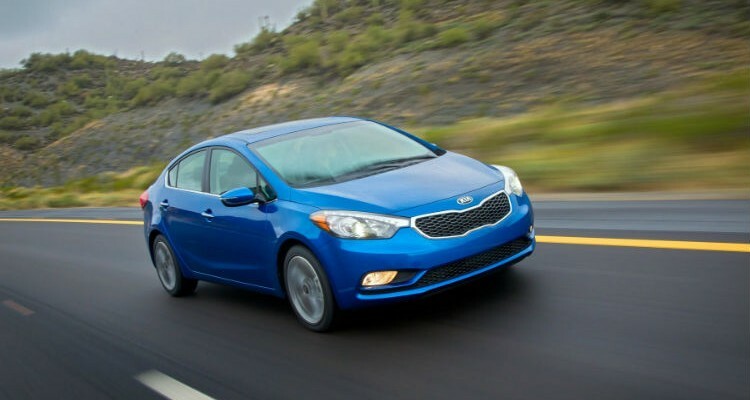 Note that in all versions KIA Forte has a 2.0 L 4-cylinder MPI, 150 @ 6200 rpm horsepower and torque of 142 lb.-ft. @ 4000 rpm; six-speed manual transmission available on the LX MT version and a six-speed automatic transmission available in versions LX AT, EX and SX. It also has a combined yield of 15.48 km per liter for manual transmission, and 15.89 km per liter for automatic transmission. The Forte is available in White, Pearl Black, Silver, Grey Metallic, Coffee, Red, Blue Celeste and Carmine Red. It should be noted that the plant does not yet have access to the railroad, because KIA has not reached an agreement with the state government yet, so these units are beng transported to the car dealerships on trailers.